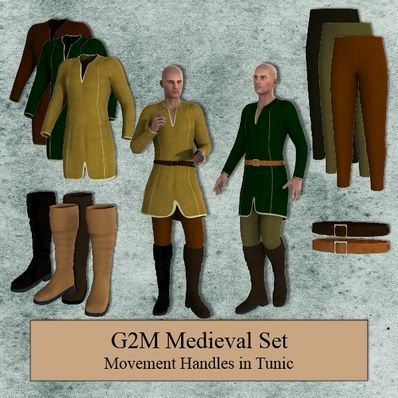 Medieval Set for Genesis 2 Male for use in Daz Studio 4.6. Foot Pose to fit feet in boots. Really thanks a whole bunch for sharing with us! Kudo Karma points to you. Cheers. I like the way you design for the eras. Clearcut. Wonderful outfits and very useful for lots of stuff.. Thanks so much for your great work.. Thank you for such wonderful outfits. This is perfect for an image I've been struggling with. Thank you so much. Now all works fine! Thanks! Sorry again. File updated a 2nd time! Thank you marcoio. I was told it was working OK, but no-one told me the textures were missing. Sorry marcoio don't understand what you mean. All materials files are there. Someone has already told me it works ok now. Can you explain more please? File has been updated as the boot file was missing. Sorry about that. Please redownload the file. A very nice set, thank you! I am so happy you make G2M clothes. Thank you ......you are the only reason my Genesis2 M&F aren't naked . Thanks for yet another great outfit. Stunning, you are an artist, Wilmap. Nice work; looks considerably cleaner then I imagine they looked back then:) Thanks. Thank you so much! Looks great! Very nice set. The boots look particularly good.